From Bergerac, take D933 south towards Eymet. After 6 km, turn left: you are at the Tasting room # 2 (KALIAN at Malfourat Sud location). If no one’s there, go on, pass the restaurant La Tour des Vents and turn right at the stop sign. 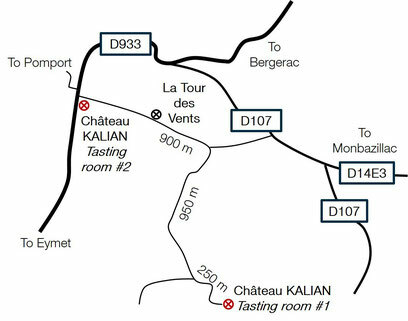 Château KALIAN’s entrance (Tasting room # 1 at Bernasse location) will be about 1 km away, on your left. (2 kms away - about 5 min by car).